The mana curve for this deck was great. Everything was four cost or lower. This ensured I didn’t ever end up with a high-cost card at the beginning that was basically a dead card all game. The only downside is that this put a clock on the games. If I didn’t pull a quick qin, then I was going to lose, because a late game two drop is useless to swing the game in your favor. 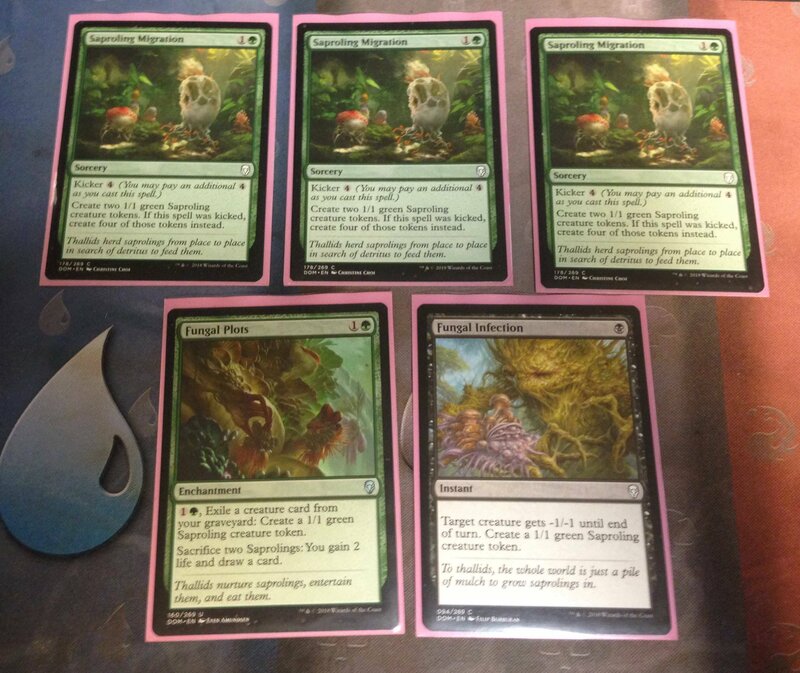 I was a little bit worried I didn’t have enough creatures toward the end of drafting the last pack. Unfortunately, I didn’t get very many uncommon saprolings, but I did get a lord and that is what guided me to this deck in the second pack. I honestly thing the deathbloom thallids are on of the better common fungus cards. This card is a threat when attacking at three power. 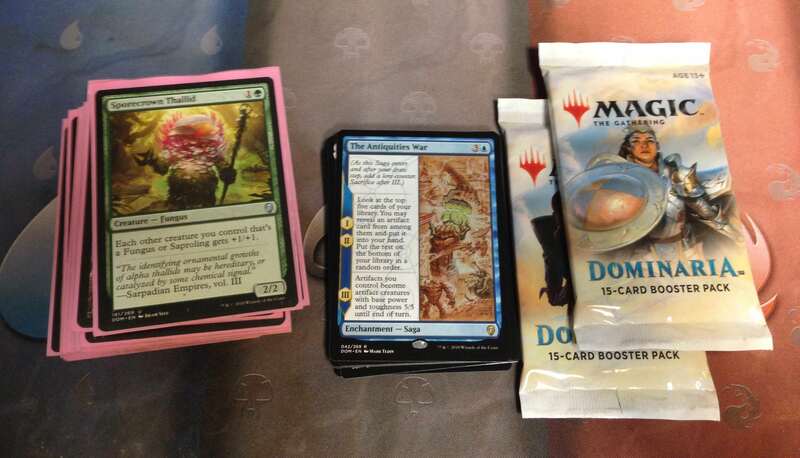 The opponent sometimes will not block because they know I’m just going to get a saproling out of it if they trade something for it, leaving me at a creature advantage. The couple of graveyard tricks I had in this deck really changed how the deck worked. These cards brought use to my dead creatures. I brought back a lord once that won me a game. I also used the Night Soil clone to flood the field with saprolings for a win on another game. Wild Onslaught and Gift of growth put me in winning conditions on one game. If you have a field full of 1/1s and swing out, you might push enough damage to give something +4/+4 to win. Wild onslaught is nuts if you can kick it. I think this might be better than the card it clones (Overrun) because the 1/1 counters stay on forever! Song and ancient are just great staple cards in any green limited deck even if you don’t have legendary support. Having a ton of saprolings on the field to use as birds of paradise for mana, to make more saprolings, then they all get +1/+1 forever is amazing. This was my basic saproling generation in this deck. I think you can add these cards instead of creatures. 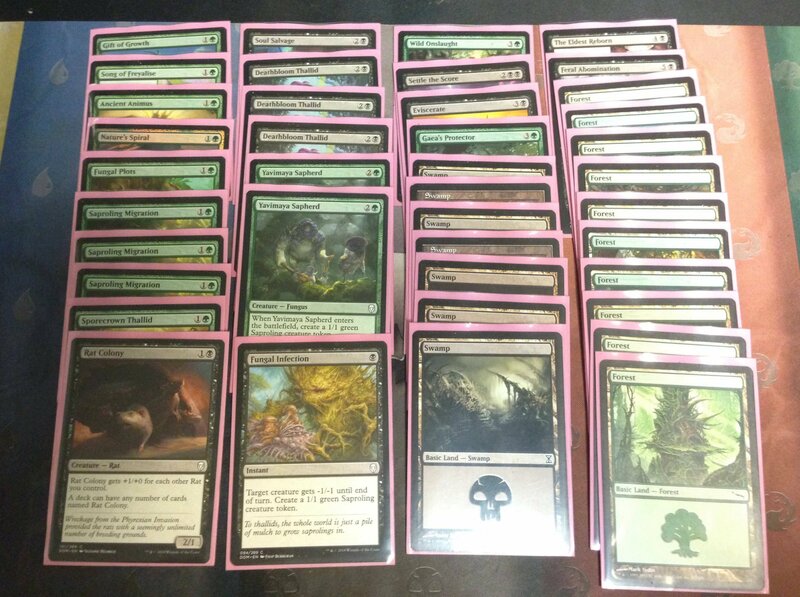 If you drafted a full deck of saproling migration you would probably win just by going so wide. It’s great to make 2 saprolings on turn two and even better to make 4 on turn 6. Here was my very expensive removal that secured that I stayed in black. 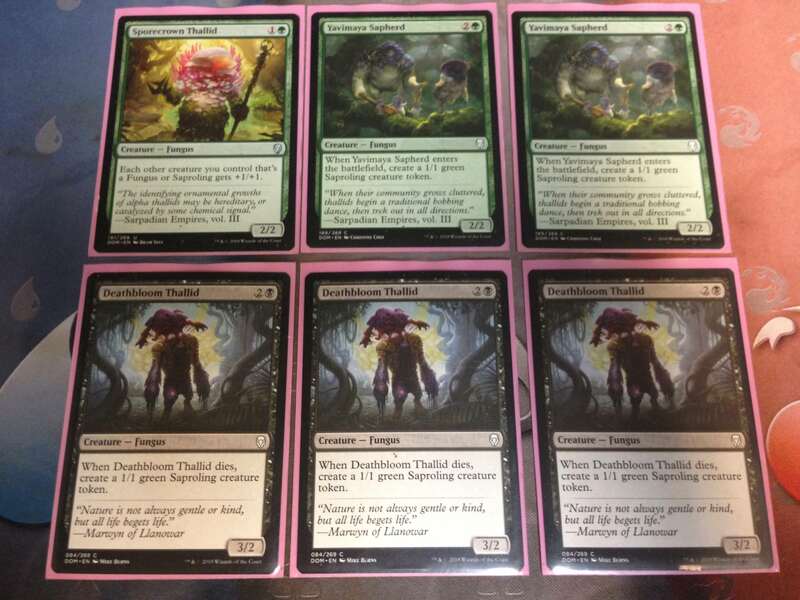 Four cost removal seems bad, but removal is removal in limited. Exiling something is great in any format. It stops all kinds of graveyard shenanigans that blue has in this set. 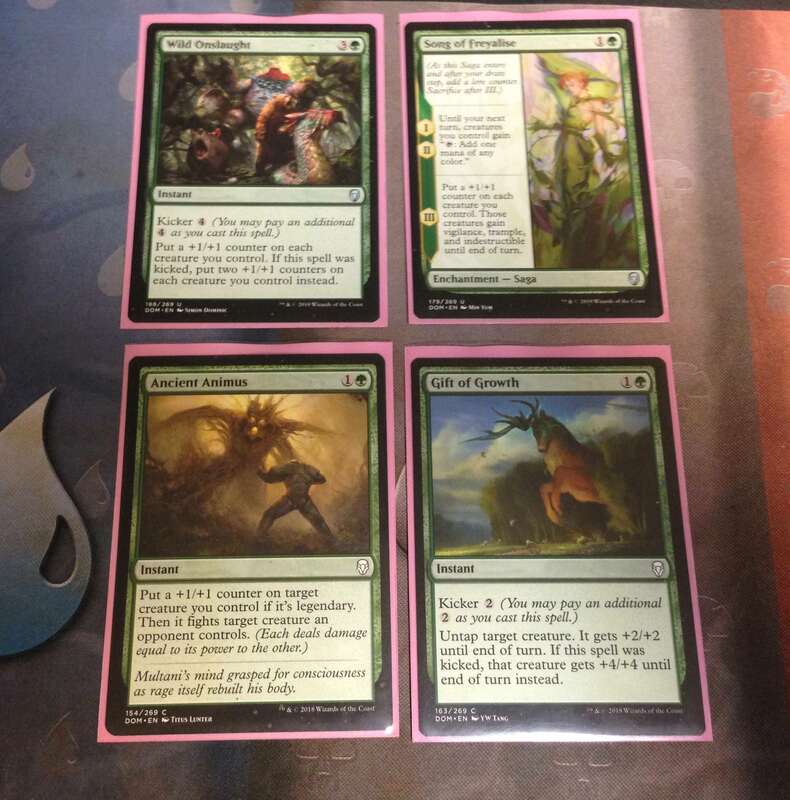 Here are my honorable mentions that I pulled and didn’t play. 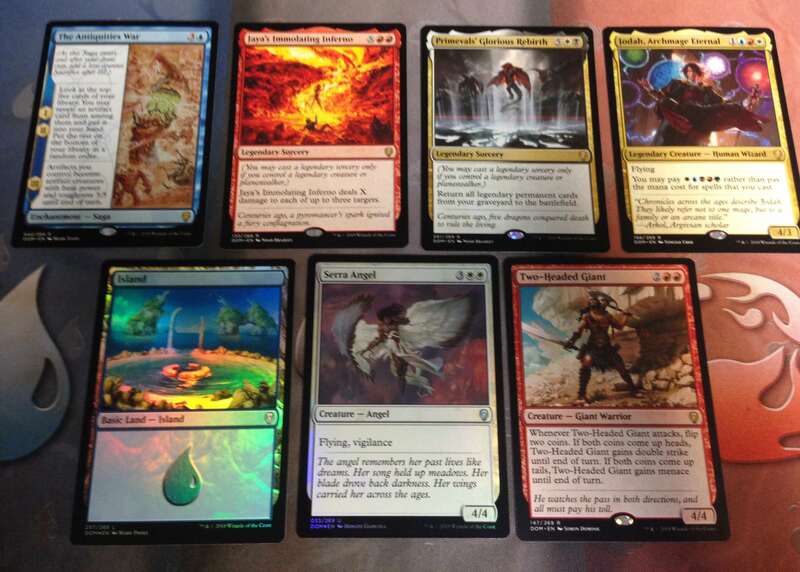 I even got a few cool foils. Overall, I think this deck was pretty solid. I wish I had pulled more of the uncommon thallids to support the synergy, but I just didn’t see them after pulling the fungus lord. I ended up going 2/1 like I always do and walked with two prize packs. I always seem to do really well in the first two rounds then get mana screwed or blown out in the end. Going to start posting pack openings again tomorrow. I’m going to tryout using Dlive instead of Dtube. Standby!